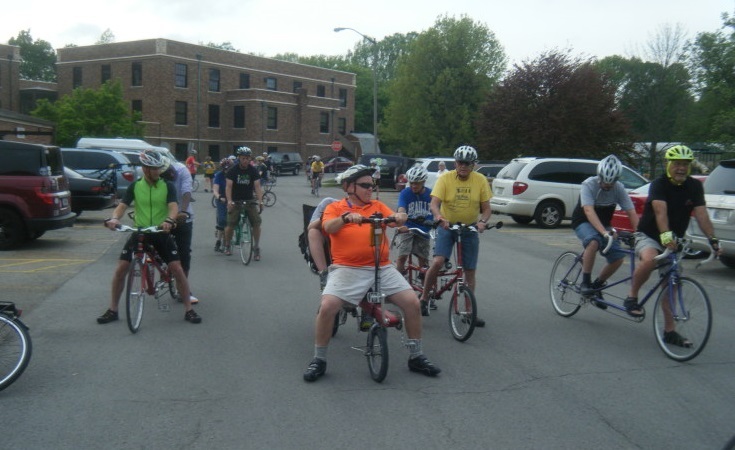 Although the name "HOOTs" has been around since the mid-nineties, the Central Indiana Bicycling Association (CIBA) has been promoting the fitness and social aspects of tandem riding for at least forty years. 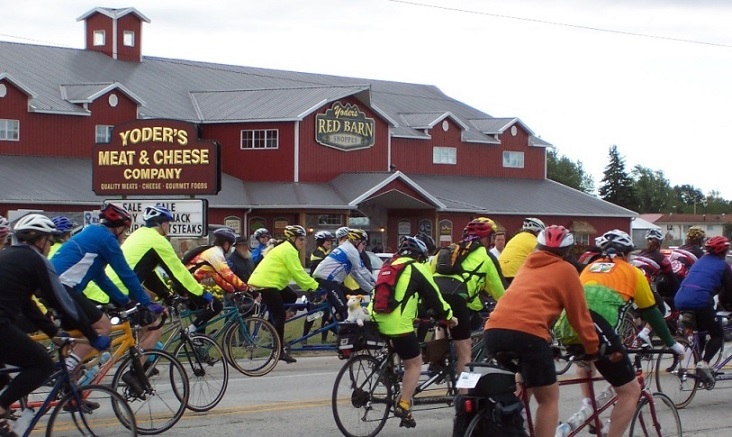 Many of our rides are in the nine-county Central Indiana region, but we will host several multi-day events in 2019 that appeal to teams from the rest of the state and beyond. Fort Wayne will be the home of our first multi-day event on the weekend after Memorial Day. 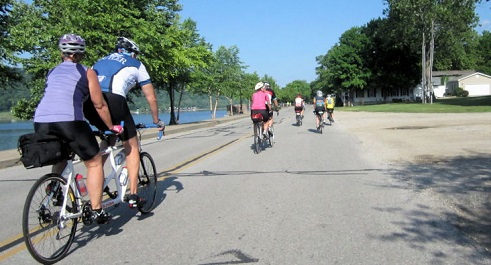 In July, we'll ride from Carmel to Frankfort for an evening at the Hotdog Festival. The big event for 2019 will be our hosting of the Midwest Tandem Rally in Columbus over Labor Day Weekend. For the sixth straight year, we'll be hosting events in May and August at the Indiana School for the Blind and Visually Impaired. This unique event pairs a captain from our group with a student from the school. 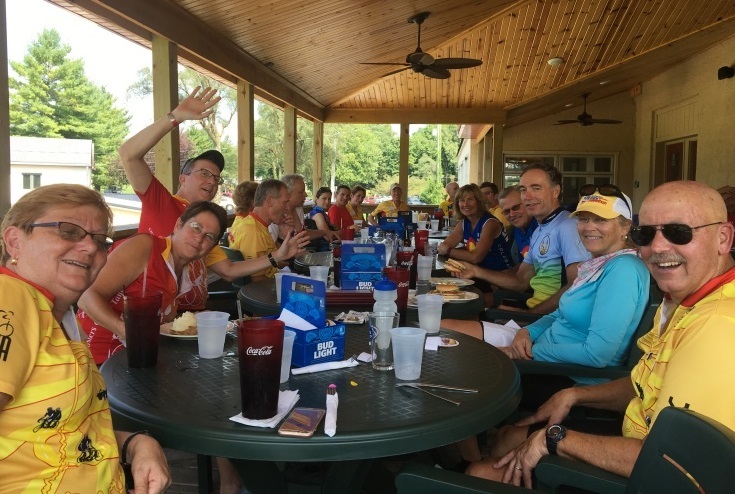 We ride about ten miles through the surrounding neighborhood and on the Monon Trail with an ice cream stop in Broad Ripple. In many cases, the captain's normal stoker will join us on their single bike. HOOTs originally started out in the western part of the state by Tom and Mona Smith around 1990 under the name of TOIS (Tandems Of Indiana & Illinois). In 1993 Tom, who was also a member of CIBA, began to have discussions with CIBA about hosting the 1995 Midwest Tandem Rally. In 1994 TOIS was brought under the umbrella of CIBA which could provide many more resources to the tandem group. At that time the name was changed to Tandems Of Indiana Society (TOIS). Keith and Janice Conaway headed TOIS in 1994 and 1995, hosting MTR on the northside of Indianapolis. There was a short time in late 1995 and early 1996 that the name changed to TRAIN (Tandems Riding Around INdiana). In 1996 Sue and Gary Robinson took charge of the group and its name changed to HOOTs. The name represents the entire state, and it also followed the trend of tandem groups to name themselves after animals. HOOTs hosted the first Midwest Tandem Rally (MTR) in Kokomo on Labor Day Weekend of 1976. When we host "Rediscover Columbus in 2019, it will be the seventh time that HOOTs has hosted an MTR.